TOP 1 Brake Fluid DOT 4 is a high performance poly glycol based brake fluid specially designed for use in disc of any motorcycles operating under moderate to severe conditions and requiring a DOT 4 type of fluid. TOP 1 Brake Fluid DOT 4 showing to its higher boiling point reduces the impact of moisture absorption and provides reliable braking performance. TOP 1 Brake Fluid DOT 4 contains oxidation and corrosion inhibitors to resist oxidation at the high temperatures encountered in the disc braking systems and to provide superior protection against corrosion of metallic components of the brake system. 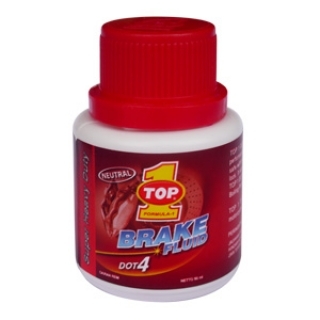 The high boiling point of TOP 1 Brake Fluid DOT 4 reduces the impact of moisture absorption while in service and provides reliable braking performance. Superior oxidative stability resists oxidation at high temperatures encountered in disk braking systems and superior high temperature stability and low temperature fluidity ensures trouble free operation. Effective corrosion inhibitors provide long term corrosion protection to the metallic components of the brake systems and TOP 1 Brake Fluid DOT 4 provides lubricity and system protection. TOP 1 Brake Fluid DOT 4 is compatible with all seals and metals used in conventional braking systems requiring poly glycol brake fluids. TOP 1 Brake Fluid DOT 4 is recommended for hydraulic brake fluid systems in motorcycles where DOT 4 type of brake fluid is specified. TOP 1 Brake Fluid DOT should never be used in place of or mixed with silicone based brake fluids (DOT 5) nor should be used where DOT 5.1 fluid is required. All brake fluids should be kept clean and dry. Dirt or water contamination can affect the performance of brake fluid and could cause brake system failure. Brake fluids can affect the vehicle paintwork, so remove spills immediately without rubbing.